I got the urge to take cupcakes to a potluck recently. With frosting. 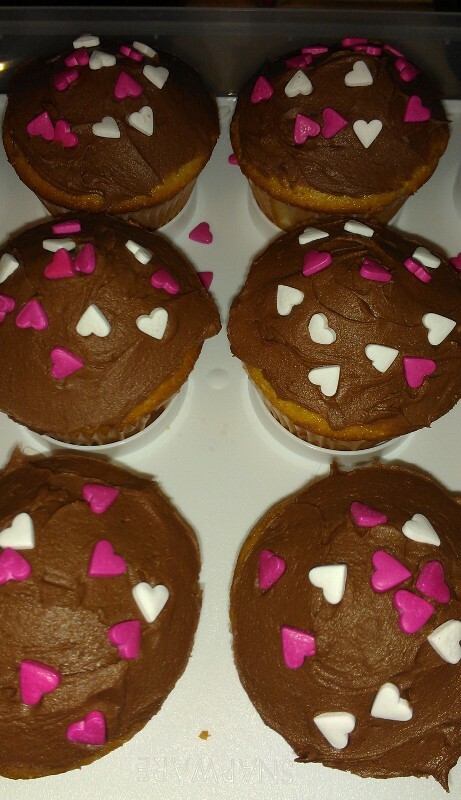 And heart sprinkles for Valentine’s Day. Luckily, I recently bought a gluten-free baking book, Gluten-Free Baking Classics (affiliate link). It had great reviews on Goodreads (where I check out ratings on any book before I purchase), so I looked forward to using it. I enjoy reading cookbooks from cover to cover – in fact, I do that on my phone while I ride the train each morning – but I skipped forward to see what cupcake recipes the book had. It had several cake recipes, but only one recipe for cupcakes. I didn’t mind, because it was exactly the recipe that I wanted – basic yellow cake that I could top with chocolate frosting. These cupcakes were fantastic. The batter itself tasted great. I was impressed with the rise on the cupcakes. The cups that were filled slightly less had a softer dome, where the fuller ones formed peaks in my oven. The cupcakes were soft and moist. They weren’t crumbly, as I was afraid they might be. 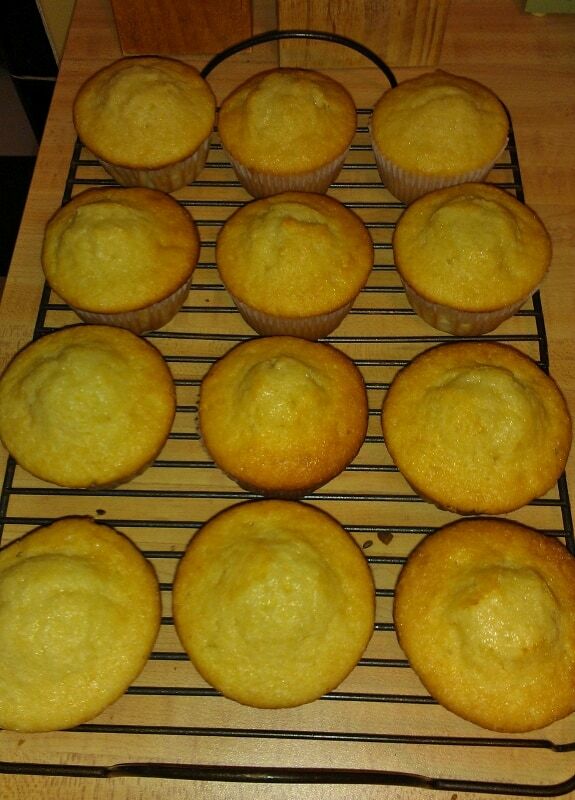 There have been a few times when I’ve made a yellow cake from scratch and left it unfrosted so I could eat it for breakfast; these cupcakes were good enough to eat that way. 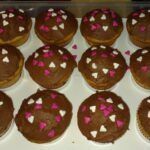 I am utterly impressed with this cupcake recipe. Alex said that of all the gluten-free things I’ve made recently, this is the first one that can completely pass for a normal baked good. This is the first recipe I’ve made from this cookbook, but if it’s any indication of the other recipes in the book, it’ll be my new favorite cookbook. Want chocolate cupcakes instead? Try these Mini Chocolate Bundt Cakes (that are easily made in muffin tins). Want other gluten-free recipes? I’ve baked quite a few. Preheat oven to 350F and line a muffin pan with cupcake liners. In a stand mixer, beat the sugar and eggs together for one minute on medium. Add flour, salt, baking powder, xanthan gum, vegetable oil, milk, and vanilla and mix on medium for one minute. Scoop batter into prepared muffin cups; this will be about 1/4 cup per cup. Bake for about 20 minutes (I baked mine 18). Cool in muffin tin for 5 minutes, then remove to a cooling rack to cool completely before frosting. The recipe suggests storing them in the fridge. 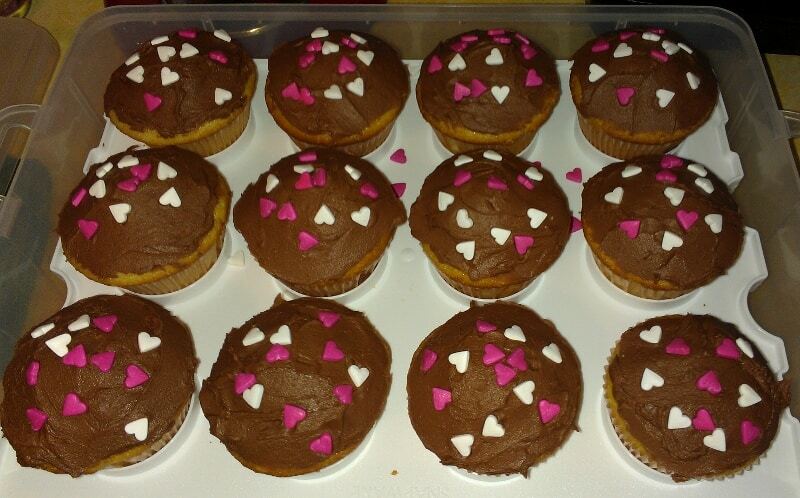 I stored my unfrosted cupcakes in the fridge overnight so I could frost them the next morning.